Almost a month ago Quora became somewhat of an obsession. I wrote of Quora with the giddy, naive and glowingly childish enthusiasm of an optimistic fool. First glance promised instant gratification delivered via an untapped source of critical thinkers. Oh man – not so fast notes. It isn’t Quora’s fault – allowing myself to dabble in places fraught with the perils of unbending logic was an obvious exercise in futility. As with anything we reap what we sow – 3 1/2 weeks, and 100,000 views later – some things I learned on Quora…. First – I’m only human, I like stats, views, and upvotes. Hardly a surprising admission although one that never matters in my wordpress world. Allowing my “knee jerk” rantings to froth corners of better judgement was captivating. WordPress epitomized polite reason – Dr. Jekyll to Quora’s Mr. Hyde. Jeckyll knew better, Mr. Hyde threw caution to the wind. A week or so in, I posed a question asking why Americans considered freedom of speech license to speak hate. Yikes – I’m either stupid, delusional, or hopelessly Canadian. I knew the answer, fully grasped America’s perspective, understood the fundamental stance of free speech in America, yet couldn’t stop myself. I didn’t understand it would bring 40,000 views, complete with a litany of arguably the most venomous personal attacks imaginable. Bottom line – 99.9% of respondents reacted without an iota of comprehension other cultures might see distribution of hateful propaganda as harmful. Answering questions proved satisfactory. My answers to why Petra was a wonder of the ancient world, and contribution to a question on the most astounding “tricks” by armies or nations at war kept me out of trouble for a while. This was a place reserved for positive exchange of ideas – a place void of accusations, yet I wasn’t content to behave myself. I knew better than to respond to preposterous religious stupidity, or ask those same people why they thought Atheists lacked morals or committed more crimes. Several weeks of hating myself for spouting sarcastic jabs finally ended with a self imposed intervention – it’s out of my system, along with sincere vows to be a better person. A few minutes ago I asked (with http://geneticfractals.wordpress.com/ in mind) how someone would explain the 4th dimension. That was 15 minutes ago and with nearly 500 views, 6 followers, and 3 answers on the record – I’m back to seeing Quora as it was intended. For anyone curious, the first few “answers”…..
We have 3 spatial dimensions, typically revert to as height, width and depth.The 4th dimension is time.Basically in order to meet somebody you need 4 coordinates or you will miss each other.On earth, these 4 coordinates are typically longitude, latitude, floor and date, but it could be another set of coordinates, however there will always be at least 4 and if there are more, you can reduce them to 4. Hence the universe is 4-dimensional. The Big Dipper needs no introduction – yet it crossed my mind, this celestial constant might deserve a little ponder. Often mistaken for a constellation, the seven stars – Alkaid, Mizar, Alioth, Megrez, Phecda, Merak and Dubhe – form an Asterism, or subset of stars within a constellation. 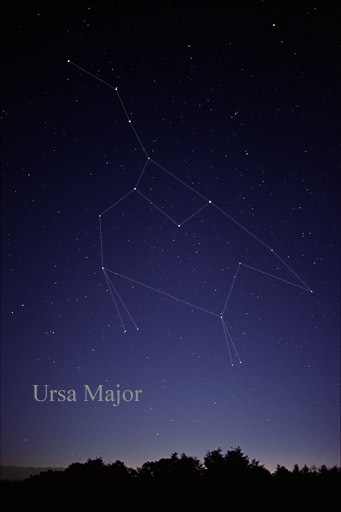 in this case Ursa Major – the Great Bear. In November, the Great Bear descends to the lowest point along northern hemisphere horizons. Micmac people of southeast Canada saw this as a sign “earthly” bears went into hibernation, and tree sap returned to the “womb of creation”. Ursa Major appears to touch the earth, winter takes full command. The great bear sleeps, her extremities falling below the horizon yet the Big Dipper manages to hover above the edge of perception. The Big Dipper doesn’t come and go with seasons, it’s circumpolar, meaning it lies in the same direction as the celestial north pole. A line drawn outwards from the pole would pass practically through the Dipper, and intersect with Polaris (the North Star). Earth rotates on its axis around Polaris, stars that are circumpolar to the north pole travel in tight circles around Polaris, therefore visible all year, albeit with a few sways and dips. If the Big Dipper was a clock moving once around Polaris every 24 hours – the “bowl” would always face Polaris – at 6 o’clock it would appear flat, 3 o’clock standing on the handle, 12 0’clock upside down, and 9 o’clock standing on the bowl. 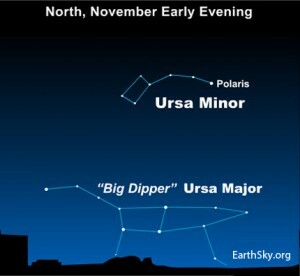 Lay eyes on the Big Dipper, finding Polaris becomes a simple matter of locating the two outermost stars of the bowl (farthest from the handle) – draw an imaginary line up and beyond for roughly 5 times the depth of the bowl – voila, the North Star. Think of the Big Dipper as a celestial guide – take comfort in understanding it will never allow you to loose your way. If you see it, you can find north. You don’t need to panic if your GPS craps out – celestial navigation won’t let you down. Ancient history is tricky – a mine field of contradiction, biblical references, conspiracy and myth. History, easily misinterpreted or recorded with bias of the author, can’t always be trusted. Interpretation, often subjective, must be approached cautiously. Archeology, at least in terms of physical evidence is irrefutable. Over the years I’ve come to accept archeological evidence as the place to embrace wonders of our past. The Sabaeans inhabited present day Yemen from roughly 1200 BC to 275 AD. For the sake of argument lets accept that approximation and move on. Biblical references to “Saba” or the Queen of Sheba – Old Testament ruler of the Sabaean people, hold little interest in this ponder. Mind bending feats of engineering magnificence obliterate dusty religious debate. Ponder the Great Dam of Marib. Try to imagine a parched and dusty empire 750 BC. So many mouths to feed – so little water. Hey, lets build a dam. We’ll need to make it 2000 feet across, control the flow of water with canals, spillways and sluices, make certain it’s watertight, and proceed without concrete. No problem – we’ll just pack all this earth where we want it, and channel water as needed. The dam stood for 1000 years before a breach estimated at 600 AD returned Yemen to the desert. We see ourselves as superior, sophisticated, technologically advanced specimens of a highly evolved civilization. Imagine the sophistication required to build the Dam at Marib. Archeological evidence eclipses written history, forcing us to think in practical terms. We rub our eyes in disbelief, blink a few times, look again, it’s still there – stoically daring us to grasp the enormity of ancient tenacity, ingenuity and above all – the will to move the earth, if it meant a better world. The Chelyabinsk asteroid over Russia on February 15, 2013 was a “small asteroid” estimated at 20 meters across. Small, yet credited with shattering windows in 7,200 buildings over 6 cities, and injuring 1,500 people. On November 14, 2014 NASA released a map produced by the Near Earth Object (NEO) program showing 556 small asteroid atmosphere “hits” from 1994-2013. Almost all of them “burned up”, and were classified as “fireballs”. Fireballs or bright meteors are known by the term “bolide”. 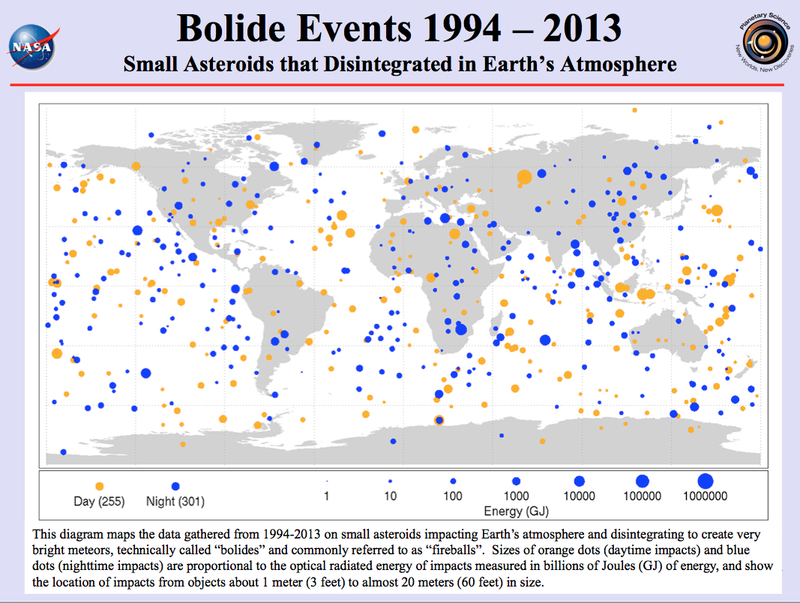 The map below illustrates bolide events as universal – the orange dots are day, and blue night. Size difference in dots pertain to “optical radiant energy”. I’m no scientist, and fear my explanation of the term might fall flat – the link below is helpful in that respect. On a grander scale, all objects greater than 100 meters and orbiting or likely to orbit Earth within 100 Lunar Distance (LD) – 1 LD being the distance from Earth to the Moon, are called Potentially Hazardous Asteroids (PHA) – as of today 1512 of these objects are being monitored. The European Space Agency Rosetta mission will continue until December 2015 – as of now, the point at which project funds run dry. Rosetta became the darling of space endeavors with the “sort of” successful landing of Rosetta’s probe Philae on the surface of comet 67P. “Sort of” because yes, Philae found a historic resting place on 67P – unfortunately not without a few hiccups. It was easy and understandable to overlook those hiccups in the heat of the moment. Philae “bounced” on the first attempt (almost a kilometer off the surface), before falling and bouncing again. The landing was successful, if all that mattered was a landing. I walked around with a goofy grin, oblivious to the unfortunate location Philae came to rest. It reminded me of early Apollo missions – headline news, something everyone talked about. If all had gone according to plan, Philae would have deployed anchors on that first “touchdown”, consequently transmitting data until March 2015. Sobering reality had a different plan – Philae came to rest in a “shadow”, a place with little concern for solar panels. Philae’s unfortunate bounce meant a meager 57 hours of usefulness before falling completely and utterly silent. Damn batteries. Philae may be down, but Rosetta isn’t out – Rosetta will travel in tandem with the orbit of 67P, observing what happens as it reaches perihelion (closest orbit to the sun) in August 2015. Important observations will detail the effect of heating the nucleus, followed by cooling as it travels away from the sun until the end of 2015. A 10 year mission for 57 hours of data might seem like a bust – not even close! The Rosetta mission is testament to everything that defines mankind. The ability to dream, question, and follow through with voyages of discovery no matter how fantastic or unpredictable the outcome might be. “Thank You For Your Service.” What Do You Really Mean By That? The ridiculously difficult landing of Rosetta Mission’s Philae probe on comet 67P ignited pondering fires of cosmic wonder – a topic I’ve been silent on far too long. Months ago I wrote a post about “baby steps” to the cosmos, followed by several more on identifying specific stars, planets and constellations. Doubtful that many people bothered to follow meticulous instructions for visual orientation, my fall back has always been enthusiastic encouragement to download Google’s Sky Map app. As I pointed my phone at tonight’s sky, it occurred to me – this is too easy. To”Google”, is to arrive at answers without the process of investigation. Sky apps are handy in a pinch, but rather like cheating on a final exam – how could I study for the test? My mind drifted back to grade school, and it hit me – I’ll make my own Planisphere. Planispheres have existed in one form or another for centuries – one disc over another, rotating on a central pivot. Or a “pocket” and “wheel” you slip into the pocket depending on where you are and what you want to see. I found the site linked below – step by step instructions for all your Planisphere needs. First you print a “pocket” based on your latitude, then you make “city” and “milky way” wheels. City wheels are basic orientation of the brightest objects as seen from your location. Milky Way wheels are full on representation of everything visible if you could view the night sky as if in a rural location, free of light pollution. The site gives latitudes and instructions for “traveling” star wheels – make Planispheres when you travel, or send them as Christmas gifts to anyone, anywhere. Of course I could go out and buy a Planisphere, but that defeats the purpose. The point is to stop and think about your latitude, realizing it truly matters to the night sky. A Planisphere forces one to understand the cosmic drift and flow. Making one teaches far more than occasional posts or instant recognition Google ever could – a star wheel offers reasons, makes us think, and takes us back to the joy of discovery.